I talk with Arnie a lot… at least in my head. . . he’s imaginary you know. We argue . . . sometimes I win . . . sometimes Arnie wins . . . sometimes we don’t argue . . . just discuss. 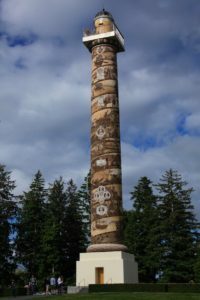 You can imagine the conversation we had recently, when I found myself at Astoria Column on Coxcomb Hill above the city of Astoria. 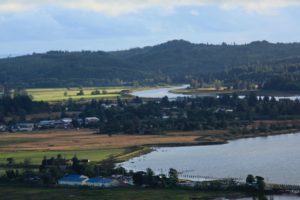 Arnie had talked me into going up there to take pictures of the Columbia River from above and the Astoria-Megler Bridge which spans the 4.1 miles of the river 14 miles inland from the actual mouth of that great waterway. It was about 4 p.m. when we eased into the parking lot. The sun was sinking toward the horizon . . . too high in the sky for sweet-light shots . . . but okay for a few pictures to document my visit. “Don’t forget, the Astoria Column is a pretty impressive edifice,” Arnie coaxed, pointing at the structure. “Okay, not bad,” I returned. I raised my camera and took a couple shots. Arnie wanted to climb the challenging 164 steps spiraling up to the observation deck at the top. We drove back into town and grabbed a rice bowl to go at a local deli. “You sure? Be a while before the light is right,” Arnie cautioned. I won the debate. We arrived at the parking lot at 5 p.m. But, Arnie was right. The sun was still too high and the clouds too anemic to make a good shot. “Four hours until sunset . . . Might as well head back to the hotel,” I grudgingly offered. Arnie won that one. We settled in. I checked out the sign explaining the column. It told us that the structure was built 1926 and that the structure and that it is part of a 30-acre city park. The 125-foot tall column was added to the National Register of Historic Places on May 2, 1974. You can follow the entire history of Astoria in the pictures spiraling up the cylinder. The changing light of the sinking sun morphed Young’s Bay into a beguiling scene. Got some shots. Below the tide was receding revealing a couple patches of pilings in the middle of the Columbia. We later learned that scores of years ago that’s where fishermen used horses pulling fishing nets to harvest salmon and other fish from the river. Eventually, the sun sank to the horizon. 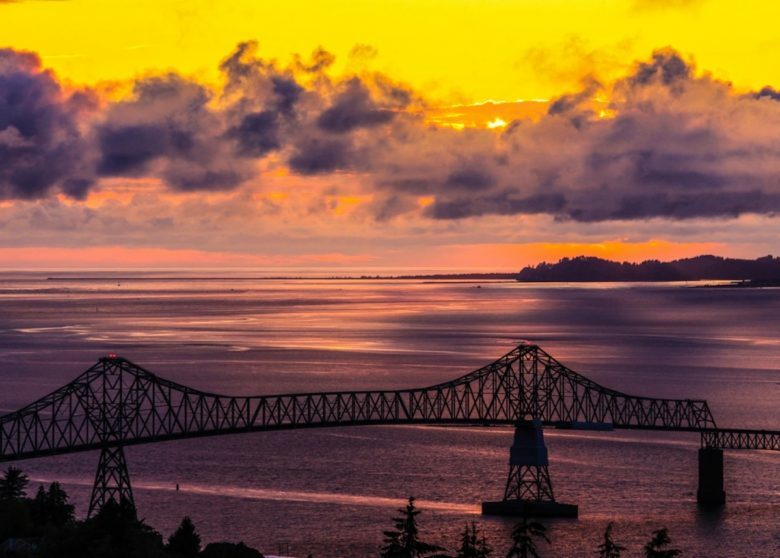 The sky turned red etching the steel ribs of the Astoria-Megler Bridge into stark relief. The red glow reflecting off Arnie’s shiny cheeks and his eyes and the expression on his face told me that as far as Arnie was concerned it was worth the wait. He was satisfied as was I.